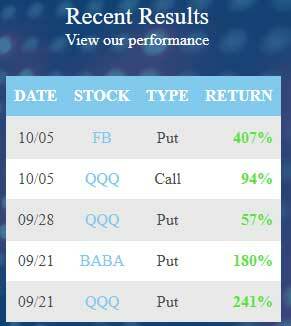 One Day Wonder Options serves real time trade alerts to their clients through emails and social media. Although, they send the trade alerts only on Friday of each week. They claim weekly options are the ideal choice for the day traders who are keen to make profits in any market. Besides, weekly options enjoy the volatility of traditional options that generate the probability of winning trades with higher gains. They creator of the service is David Drabik but haven’t disclosed his personal profile or any information related to his trading career. To contact One Day Wonder Options you can send them emails by simply filling their contact form. By using your email address, you can also subscribe to their free news alerts about market updates. One Day Wonder Options introduce themselves as the prime binary options trading signal provider in the financial markets based on their successful track records as they’ve claimed in their website. They believe that trading less in the market and focusing on potential trade opportunities only once a week helps them to be more organized, disciplined, and promising as an organization. This is in line with my other recent binary options reviews, as you can see with Consistent Options Income, OptionWisdom, and Options Payday Alerts. They serve the trade signals only on Friday mornings between 9:30 AM and 12:00 PM of each week through emails and other preferred social media networks. They claim their strategy is able to take the advantages of markets with high liquidity and detect profitable binary options trade opportunities on a consistent basis for their clients. According to their signal history, it is quite clear that they provide trade signals fir stocks. Those who are interested to trade Forex and Cryptocurrencies may need to clarify with them in advance before final subscription. It depends on how many potential trade setups they manage to detect within the early morning of each Friday. According to their statement, the number of signals varies from 1 to 3 (max) each week. Again, this is a low trade frequency, so understand that before you consider getting involved. Nevertheless, the signals are sent as links directed to their main website. It is required to click and follow the link in order to unveil the recommended trade signals. Trades should be executed within 15 minutes upon receiving the trade signals alerts. Each signal is valid for 24 hours only. Clients are offered assistance surrounding trade-related issues through their customer support department. There is no doubt that the performance shown in their statement is quite lucrative and profitable. However, these records are unverified and not audited by any third-party regulatory organizations. Subscribed clients get a personal account with a username and password in order to access all the trading related features on their website. Unfortunately, there is no license no. mentioned anywhere in their website that claims themselves as a permitted trade signal service provider. Furthermore, they have NOT disclosed any certificate that proves them as a regulated organization in the financial markets. One Day Wonder Options tried to attract traders by offering highly profitable trade signals with self-certified profit statements. Besides, they’ve failed to disclose their physical address, phone numbers, license, and verified documents neither in their business profile nor on their website. It is an ordinary approach to clients in this market but doesn’t tick all the boxes to verify them as a trusted trade signal provider. If you have any experience with this group, please leave your comments below the article now. Summary: They provide an interesting service, but lack in the areas of transparency with their trading results, and company information.